It's amazing how quickly the Fred comes round again.Ã‚Â After getting my entry in on the 1st of January, I've had a full four months to forget about last years horrors, but then with two weeks to go I started to have nightmares. 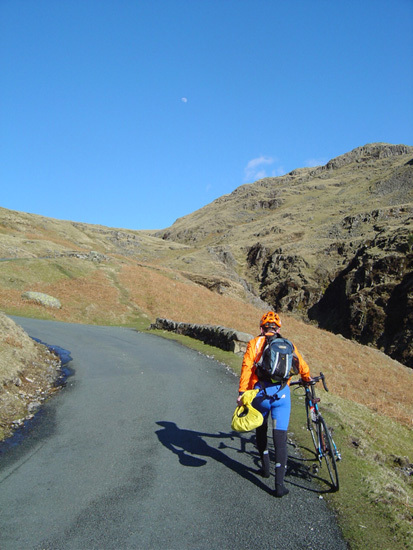 The Fred is probably the longest established cyclosportive on the UK scene and the one with the most fearsome reputation.Ã‚Â What makes it so hard is the combination of the distance (114 miles) and the near relentless and steep climbs right from the start.Ã‚Â Throw in the unpredictable early season Lakes weather and an anti-clockwise route which offers no bail out options and you get a recipe for physical and mental torture. So let's get the excuses over first!Ã‚Â My combination of height and weight means I'm far from being a born climber.Ã‚Â On top of this I'm nursing a sore knee, which is a reminder of Belgium pave, having ridden the Tour of Flanders sportive just a few weeks previously.Ã‚Â Finally my best bike is still at the menders in Italy, so I'm forced to resort to my trust, but heavy and over geared winter trainer. 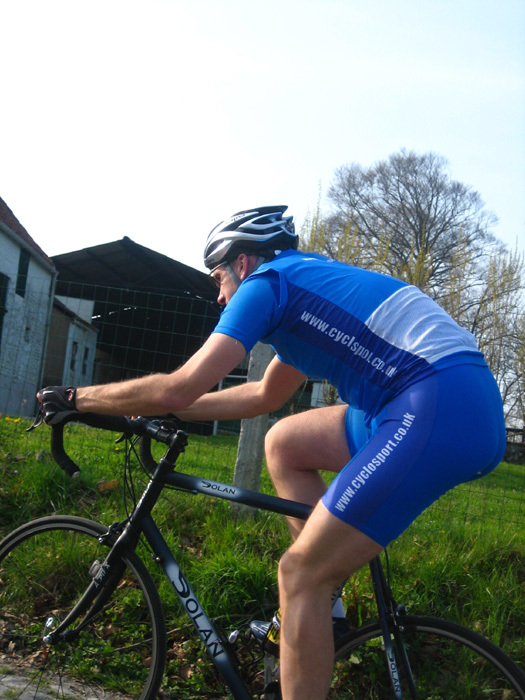 Big Simon Training - On the Koppenburg! This will be my second time riding the Fred and the third time I've ridden the route, so no surprises and no chance of self deception about what I'm in for.Ã‚Â I'm riding with two other riders, Simon Oliver and Mark Shannon. When I say "riding with", I know it's going to be more like "starting at the same time as", because both these guys are better climbers than me.Ã‚Â With a 12am cut-off time at the first feed stop (50 miles in), we opt for a 6:30am start time, with some of us more likely to need this safety margin than others.Ã‚Â Despite dreadful weather forecasts the day before, come the start, the gods are smiling on us and it is dry and windless. Seatoller means the start of the climb up Honister.Ã‚Â Honister is just one of those climbs that doesn't so much have a sting it the tail but rather a slap in the face at the start.Ã‚Â I know what it coming and dump all my gears at the start; this is not the sort of climb to be worrying about anything except keeping the pedals turning.Ã‚Â With a gradient of 20% in places, for me it's a battle to keep the front wheel on the ground and I find myself in an acrobatic balancing act, fighting to push down on the pedals whilst not pulling up on the bars.Ã‚Â I console myself with the thought that it is quicker than walking and just soon enough find I'm already past the steepest section.Ã‚Â The descent of Honister should be a pleasure, but the gradient, the narrow, twisting, stone walled sides and the memory of the poor unfortunate that came a cropper last year, make it a challenge in its own right. At Buttermere I quickly refuel and head off up Newland Pass, where a strange ethereal sight greets me.Ã‚Â The climb stretches out in front of me.Ã‚Â The road is dotted with cyclists, whose rhythmic bobbing and breathing in unison, is like some ballet performance played out in slow motion and the silence is only broken by the creak of chains under load. Newlands leads on to Whinlatter whose top is swarming with friends and family cheering the riders on, before the drop in to the navigationally confusing Lorton triangle (many enter, but not all leave!). Then there's the drag up to the aptly named Fangs, before another descent and the climb up to ColdÃ‚Â Fell.Ã‚Â Today it fails to live up to its moniker and there is glorious sunshine and panoramic views out across the nuclear reprocessing facility at Seascale.Ã‚Â It's a section of the ride where the climbs aren't so steep, but they are sufficient to just grind you down.Ã‚Â It's also here that the though of the Hardknott and Wrynose start to loom in your mind.Ã‚Â Or in my case the pain in the knee starts to kick in, as the prescription pain-killers wear off. Another quick food stop and you're back on the road, ready to face your demons.Ã‚Â The drag to the bottom of Hardknott seems interminable, with only the climb of Cockley Beck to remind you of the reality of what's to come.Ã‚Â By now my mind was already playing tricks on me and I'd forgotten how long and lumpy it really was between the Beck and Hardknott. Wrynose - Straight after Hardknott! 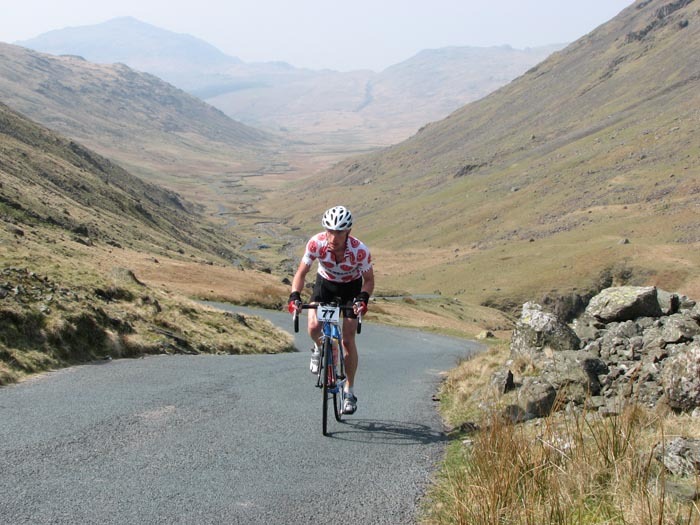 On the final climb up on to the main road in to Coniston, I meet up with a couple of guys I'd been chatting with in the restaurant the night before and we time-trial it in to the finish, exhausted and glad it's over for another year. At the start of the day I'd hoped to beat my previous time and was looking to finish in under 9 hours.Ã‚Â When I get my final time, I find out that not only have I not beaten my previous time, but I'm actually slower by a whole 18 seconds! Still there is always next year, NOT !